Iran's defense minister says the Iran-Syria cooperation won't be decided by a "third party." Iran's defense minister, Amir Hatami, visited Damascus on Sunday and said his country will continue its support of the Syrian government to ensure improved security in the region, The Associated Press reported. Hatami added that the nature of the two countries' cooperation won't be decided by a "third party." "No third party can affect the presence of Iranian advisers in Syria," Hatami was quoted as having told reporters in Damascus. His comments came at the start of a two-day visit to Syria, where he met with Syrian President Bashar Al-Assad and other senior officials. The high-level military delegation headed by Hatami is expected to boost cooperation between the two countries, and the two are expected to sign new military and defense agreements, according to AP. Iran has been providing Assad with both financial aid and military advisors against a range of opposing forces since the start of the Syrian civil war in 2011. Ali Akbar Velayati, a top aide to Iranian Supreme Leader Ayatollah Ali Khamenei, recently made clear that Iran would withdraw its “military advisers” from Syria and Iraq only if their governments wanted it to. Hatami said on Sunday he hopes Iran can play a "productive role" in Syria's reconstruction. 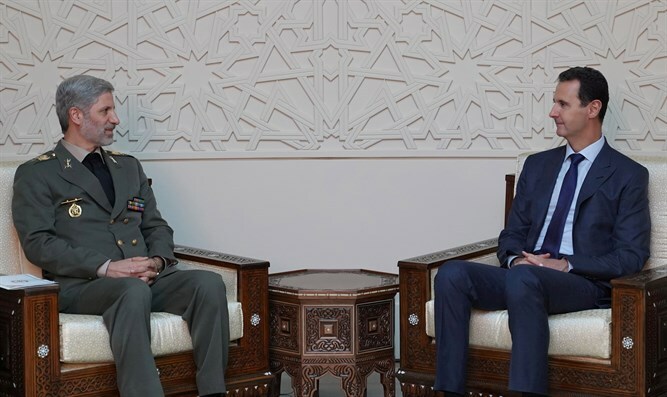 "Iran will spare no effort to maintain Syria's territorial integrity, because security in the country will help (improve) regional stability," Hatami was quoted as having said in a meeting with his Syrian counterpart, General Ali Abdullah Ayyoub. Israel has expressed concern over Iran's growing influence in Syria, while the United States has been pressing for Iran to withdraw its fighters from Syria. A U.S. official said last week that President Donald Trump and Putin agreed in principle during their July summit in Helsinki that Iran should exit Syria.